DupliColor started out in 1938 with one man filling bottles of automotive touch-up paint from bulk OEM sources in his garage. 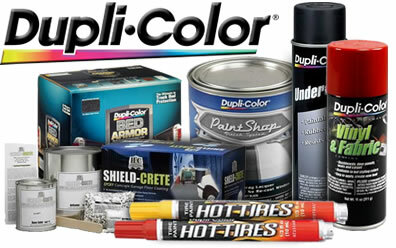 Today, DupliColor is still the industry standard for perfect-match paints, plus so much more. Repaint your whole vehicle with the easy-to-use DupliColor Paint Shop Finish System—it’s ready to spray, no mixing required. DupliColor also formulates numerous automotive specialty coatings, including pickup bed coating, high-heat engine enamels, rust stoppers, and protective coatings. Take your paint job to exciting new heights with DupliColor’s special effects paints, including spray-on metallics, metalflakes, reflectives, textures, and the color-shifting MIRAGE system.